Imagine you’re sponsoring a seminar on avoiding the scourge of blocked images in email marketing. When it’s time to send the email invitation, what’s the one bit of formatting that you would definitely want to get right? Remember, your seminar is about blocked images in email messages. Perhaps you’d zero in on making sure your message is readable even with the images blocked? Yet the nearby inbox screenshot shows how one organization mangled such an invitation. The message was unreadable in an Outlook preview panel. The large, blocked images meant I couldn’t see the headline, “Blocked Images: When Bad Things Happen to Good Email,” presented by Goodmail Systems, Cheetahmail and Email Experience Council. But you can avoid their mistake by following these guidelines to give your HTML email blasts a chance to be seen. Insert links in the body of the email, not solely as buttons/icons. Display your full URL as text at least somewhere in the message. Vertical Response has some good examples of emails from major retailers who don’t get the blocked images issue, as does Messaging Times. 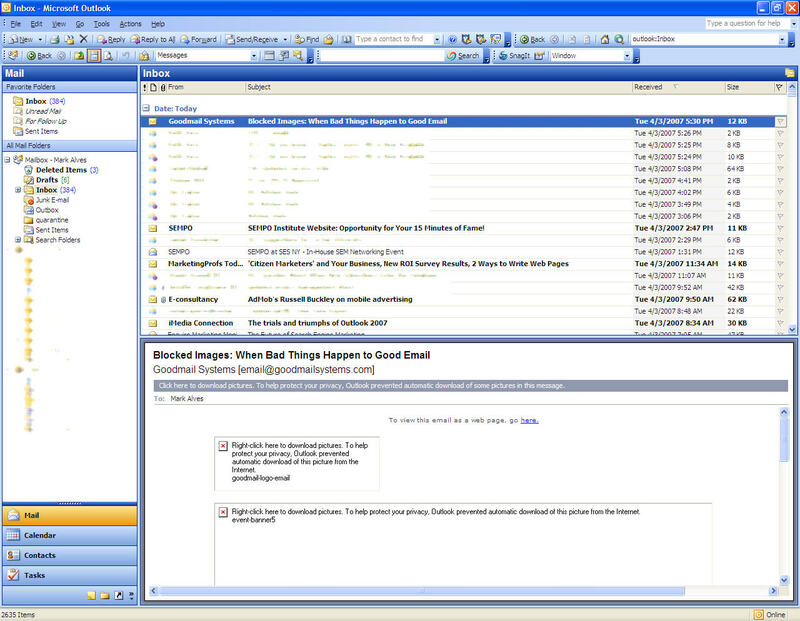 MarketingSherpa has more resources on this and other email marketing issues. Any such whoppers in your in-box? Or, gulp, your sent box? Share ’em here or send them to me. Thanks. You can’t make this stuff up.